CyArk is pleased to announce that 3D Scan, of Lesmo, Italy, has been selected as the recipient of a free booth at SPAR 2015. Their donation of the beautiful Arengario di Monza, joins the diverse collection of Italian heritage sites in the CyArk Archive. The seven-person team headed by Sergio Sabbatini and Tiziano Colombo has been scanning Italian heritage since 2001, when Mr. Sabbatini scanned the beautiful Walls of Milan using a Cyrax 2005. Three years ago, the two men decided to invest in their own scanner, a Z&F 5010C, after operating one on a rental basis for a number of survey projects. Since that time, they have expanded their services to include as-built documentation, BIM and 3D modeling, and site monitoring for a variety of commercial clients. 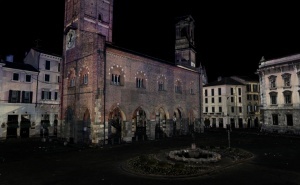 However, scanning heritage throughout northern Italy has remained an important side-project for the firm. 3D Scan began scanning the structures of nearby Monza on a pro bono basis last year. Both the exterior of the Piazza del Duomo and Arengario of Monza have now been captured, and they plan to return this year to complete work on the interior. Located at the center of Monza's historic market square, the Arengario, or old Town Hall, was not only the most important civic building in the city, but served as a powerful symbol of the city's communal autonomy. Constructed during the second half of the 13th century, the structure strikingly resembles the Palazzo della Ragione in Milan, a grander administrative building constructed only 20-30 years prior. Much like its larger counterpart in Milan, the Aregnario di Monza served a dual purpose. The ground floor, a covered arcade of massive stone arches, provided a commercial hub from which the regions primarily agricultural residents could sell their products, while the first floor meeting room, provided a space for the Council of the Commune to convene. In 1330, the Arengario underwent one of its first renovations, when a logia and balcony were added on the south side of the structure. From the small porch, civic decrees were read to the crowds of citizens who made their life and living in the medieval town. Likewise, the robust gothic-Romanesque bell tower, added later in the 14th century, provided a clear representation of the administrator's authority. Much as the balcony provided a literal platform for the administrators’ power and a site from which to expound their decrees, the bells' chimes were an immutable force that regulated the flow of daily life in a world where mechanical clocks were a luxury item. The Arengario remains a center of public life to this day. Where the upper chamber once hosted debates between the city's distinguished residents, it now houses art exhibitions, musical performances and other cultural events. 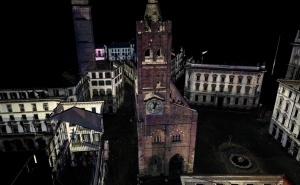 I encourage you to take a look at some of 3D Scan's other historical projects, like the Campanile in Corbetta, where the city's oldest church, with origins in the third century, is accompanied by an imposing 19th century tower. If you will be attending SPAR please stop by our booths at tt1 and tt2. We would love to hear about your own forays into heritage scanning! Data Donations submitted on-site during the conference will also be eligible for free software donated by our Technology Partners Autodesk, Leica Geosystems, 3D Systems, and Trimble, to be announced April 2. CyArk and 3D Scan hope to see you there!